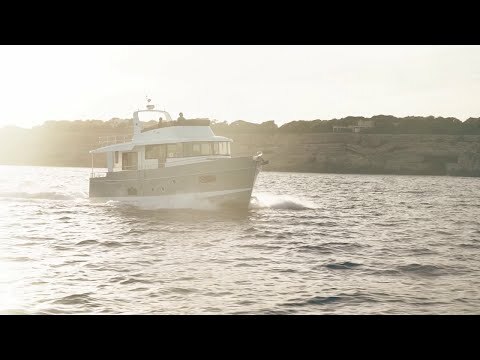 Flagship of the range that reinvented the traditional trawler, the 2016 version of the Swift Trawler 50 offers a greater amount of interior space and light. For romantic or family getaways, it appeals to all numbers of crew for its intelligently-designed fittings and very easy handling. Resulting from the collaboration of Bénéteau Powerboat, the architect Michel Joubert and the designer Pierre Frutschi, the Swift Trawler 50 boasts a contemporary silhouette emphasized by a very fluid flybridge line, redesigned for this 2016 edition. Her hull is specially designed for IPS engines (2 IPS 600) and this long-distance cruiser combines outstanding stability and manoeuvrability. The high bulwarks surrounding the deck reinforce the safety of movements on board. Pilot bench seat in " PVC"
Serving hatch unit with "serving tray"